It’s great that you can easily charge your smartphone in your car, but what about your laptop and all the other devices you carry with you? Don’t worry, we’ve got you covered. 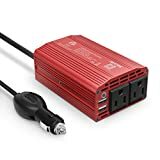 The BESTEK 300W Power Inverter converts any single car charger outlet into two three-prong 110V AC outlets and two USB outlets. That way you can plug in your laptop, phone, tablet, eBook reader, and whatever else you want.